I love yoghurt, I’ve had less of it in recent months as I’ve learned more and more about the paleo diet. I was approached several months ago by the PR company for Easi-yo, the first contact was to invite me to an event with live demonstrations, taste testing and a full product set to review, sadly I only had 2 days notice and couldn’t get down to London in time. I’m glad they remembered me though, as 3 weeks ago they approached me asking how I liked my product. Oh no! I had to explain to the new PR company that I never actually received one and I’d love to try it if anything comes up. Just my luck, they had a brand new Easi-yo maker to be reviewed and they’d send one right out to me. It arrived the next day, wahey! I opened up the box with the new style of EasiYo Yoghurt Maker maker (this is the old one), Inside the box was a massive red capsule, two pamphlets and a sachet of strawberry yoghurt mix. On opening the box, It seemed sleek and stylish, something not too big, so if you’re a regular yoghurt eater, you could keep it out on your work surface. If not, it’s easy to store in a cupboard compared to the old large round yoghurt makers with plugs and wires. All surfaces are smooth and easy to wipe-clean, except of course for the yoghurt jar, which should always be steamed clean to remove bacteria! There was a pamphlet inside the box that explained how to work the machine (super simple) all you have to do is pop room temperature water in the yoghurt tub,which I found in the capsule, pop the full sachet of mix into the tub and give it a good shake. Pop the tub into the capsule and “fill” up to the base with boiling water. However I can’t see that the yoghurt would thicken if the water isn’t touching the yoghurt mix at all so I filled mine an inch up and patiently waited. I actually didn’t sneak on this one, I left it the whole time (12-16 hours, I chose 16) I love thick yoghurt. It worked perfectly! There was no liquidy mess on the top, the mixture was thick like whipping cream and the smell filled the air when I took the lid off, very strawberry indeed! As I normally do healthy recipes I really wanted to do a recipe post with this but the only flavour sachet being strawberry it didn’t seem right. 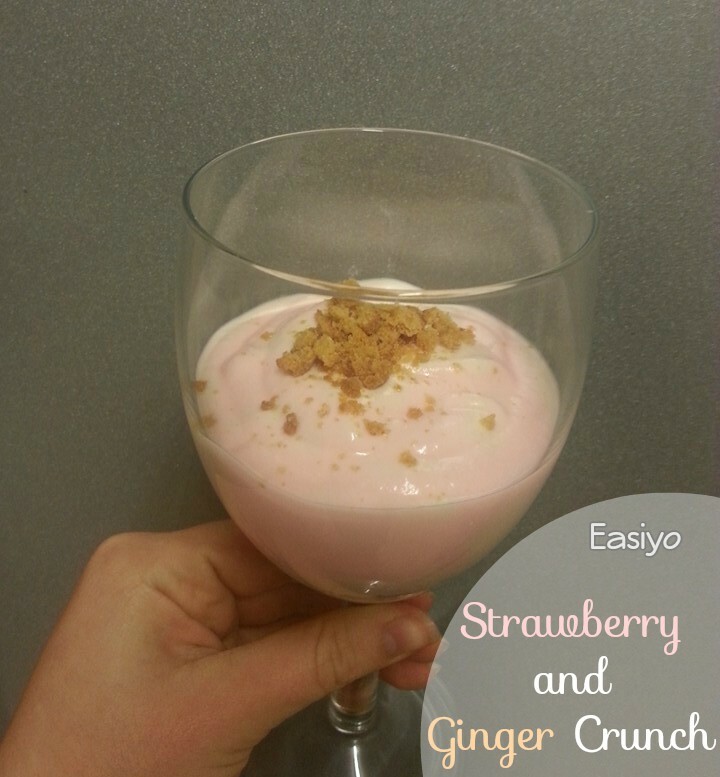 So I tested a few things out and the best flavours I came up with were strong and sweet “strawberry and ginger crunch”. As you know my camera has been out of action for 2 weeks now, which is killing me..so the photos aren’t brilliant but you can see the thickness of the yoghurt. The flavour was strong and perfect for a sweet dessert, or to take for lunch maybe? just plain or with some chopped fruit; raspberries, blackberries, strawberries, cherries, maybe even mandarin slices.There are some small storage jars I found for it, my mums buying a set for taking out for lunch. When making my own yoghurt, it worked quite well, using my top tip I saved two table spoons of the mix to add to my own yoghurt ( I only made a pint) and it thickened up within 12 hours! There was no flavour to the own-made yoghurt though and it didn’t taste like greek either, so I recommend adding a flavour to it! I added vanilla which was perfect as I’ve updated my butternut squash pie recipe to be gluten free now. A. Leave it for the full 12 hours and B. Only use the sachets. 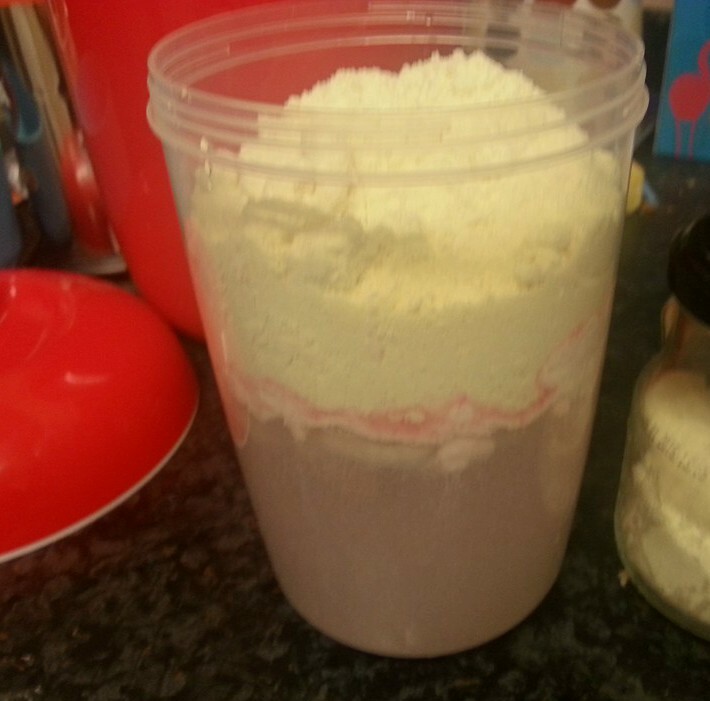 However that’s not my experience so far, but if you do find this to be the case, here’s the issue and solution: This can happen because the manufacturers put in powdered milk in their mix which makes it thicker and lovelier, so.. my tip is: If you’re planning on using your own mix just add in a table spoon or two (your preference) of milk powder to make it thicker and leave it for the full 12-18 hours! Simple. Like I said, I read some reviewers had some issues; as I did , I didn’t set properly, they didn’t like that they had no choice but to buy the sachets but they were workable and all in all the easiyo makes it hassle free compared to making your own. No more simmering milk and temperature controlling a yoghurt steamer, paying close attention to the clock. Just pop the container in a cupboard and leave it, done! So I guess I’m leaving it in your hands really, you can make your own milk yoghurt mix in a heated container or you can add a mixed powder and water make yoghurt in a heated container! They’re so similar but ones easier, satisfaction removed though! If you’ve used one, let me know about it, how did you get on? Made me giggle, being blonde, I find old lady white hairs all the time and just freak out. Don’t think I’ll grow old gracefully! Grey hair can look really cool. I haven’t found any in my own hair yet though. Ah I can’t believe you just whipped this little poem up 😀 I’m going to remember it when I spot a grey hair myself. Definitely a great poet! Especially if you whipped this out in 5 minutes!! I got my first grey hair the other day – meh! I have decided to not let it bother me (hopefully). Easier said than done though.